It didn’t take long for word to get out that Greg Brooks and the crew of the M/V Sea Hunter was soliciting aid for Haiti after their devastating earthquake. Greg already had experience with this kind of thing. In 2005 when Hurricane Katrina hit the Atlantic Coast, he and his crew took the M/V Diamond from Key West to the boroughs of Louisiana with much needed aid. There were many obstacles along the way, but they never gave up and successfully delivered all they had. It’s so wonderful and amazing how people come together during times of need. When the word got out that Sub Sea Research was soliciting aid, people from all over called to volunteer in any way that they could. You have to remember, it was January in New England, the coldest month of the year, and we were on the waterfront. Being outside was far from pleasant, but it was nothing in comparison to what the people of Haiti were dealing with on a daily basis. Everyone kept that in the back of their minds as they worked in the zero degree weather. I never once heard a crew member or volunteer complain. We all had a common goal in mind, and that was to get as many supplies loaded onto the ship and deliver it soon. The local newspaper and television stations were at the dock in Portland when the M/V Sea Hunter steamed into Portland from Boston. They were helpful on getting the word out. 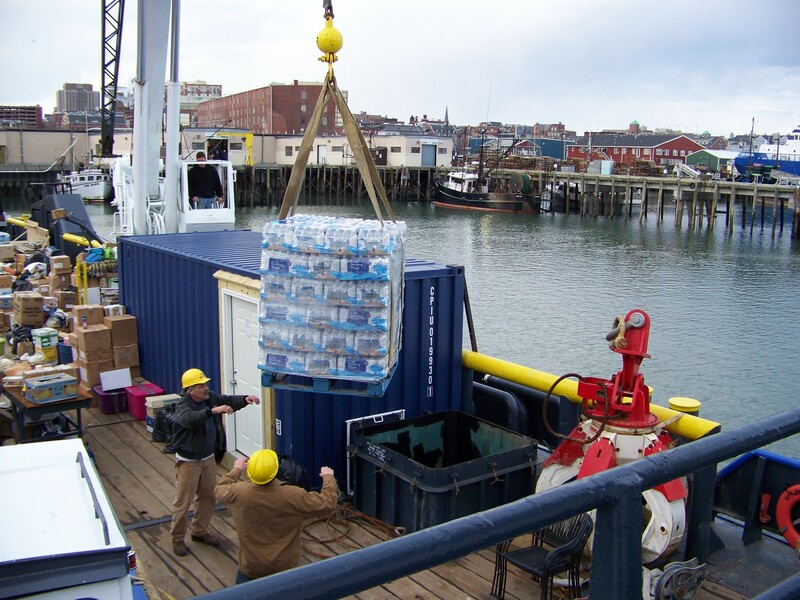 The plan was to be in Portland for a few days to load donated supplies onto our 220’ ship. We would then head back to Boston and do the same. Once everything was loaded in Boston we were heading to Miami. There was a large Haitian community that heard about us, and they too wanted to donate aid. For three or so long days and nights, everyone worked tirelessly in the freezing cold on the Portland pier. Organizations, businesses, schools and individuals came with cars loaded down with everything you can imagine. There was new and used clothing, toiletries, household goods, tents, school supplies, toys and of course lots of food and water. Many also gave cash donations. We received a portable hospital on wheels, which I knew would be needed in a small town. Poland Spring donated pallets of bottled water. Barber Foods, a local food manufacturer, donated boxes of their delicious frozen foods for the crew and volunteers to help ease the cost of the trip. Dave Barber and Bill Schmitt, owners of the company actually delivered and help load it into our walk in freezer. A local high school donated hundreds of new beanie babies. Each and every person that came by to drop off supplies would leave us with words of encouragement and a thank you. Some stuck around to help for a few hours allowing others a much needed break. Again, it was a sight to see and experience. Complete strangers heard a call for help that was needed half way around the world, and they didn’t hesitate to deliver. Out of all the wonderful and hardworking volunteers, there were three that blew us all away, The Freeport Flag Ladies! I had heard about them from the news but really didn’t know much about them. Let me tell you, these ladies are God’s angels on earth. 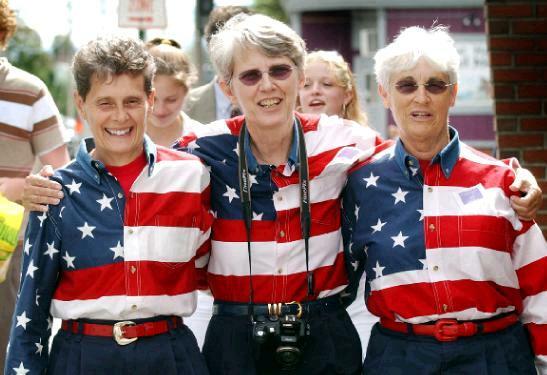 They are all retired professional women who love this country and their fellow man. When 9/11 happened, they knew they had to do something. At first they would show up each Tuesday morning on Main Street in Freeport and wave the American Flag. It progressed to driving three hours to the Bangor International Airport or Pease Airport in N.H. to greet our soldiers that were either leaving for the war or coming home. They would take pictures, shake their hands and hug their children. They collected and boxed up comfort items to mail to the troops. They used their own money and throughout the year would have yard sales and grow and sell flowers to help fund their ongoing support. These ladies continue this to this day. They showed up the first morning dressed in red, white and blue. They worked until night with only a couple short breaks (we forced them to take) to warm up. They stood in the freezing cold air and met each car with a smile. They carried heavy boxes of supplies and helped organize it on the ship. Whatever you asked of them, they did it without hesitation. The second and third morning, they were the first ones on the dock to again lend their hand and usually the last to leave each night. I remember throughout those three days, watching these women work nonstop, always with a smile on their faces. If there was a little frustration on someone’s part, they were the first to put an arm around them and reassure them that everything would work out. Working beside these ladies for three days and nights taught me something about the human spirit for which I will always be grateful. Greg, the crew and I, will be forever thankful for all those that donated goods, volunteered their time and continued to lift us up during that difficult time.